This medium sized ginger sometimes develops a purplish tinge to the underside of the leaves (Cooper and Cooper 1994, Nicholson and Nicholson 1996) and may have a slight lemon scent when crushed (Roberts et al 1995). 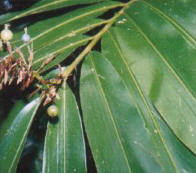 It produces white flower which are followed by, as the common names suggests, small round blue fruits. Once the crisp flesh is taken off, the flaky white flesh can be eaten and the seeds sucked, or even chewed for the full strong flavour. These fruit were popular with Indigenous rainforest people(Roberts et al 1995), and they could apparently be followed by their trail of spat out seeds (Low 1991). Aboriginal people also reportedly used the leaves for wrapping food during cooking and ate the tips of the rhizomes that were ginger in taste (Roberts et al 1995, Low 1995, Nicholson and Nicholson 1996).